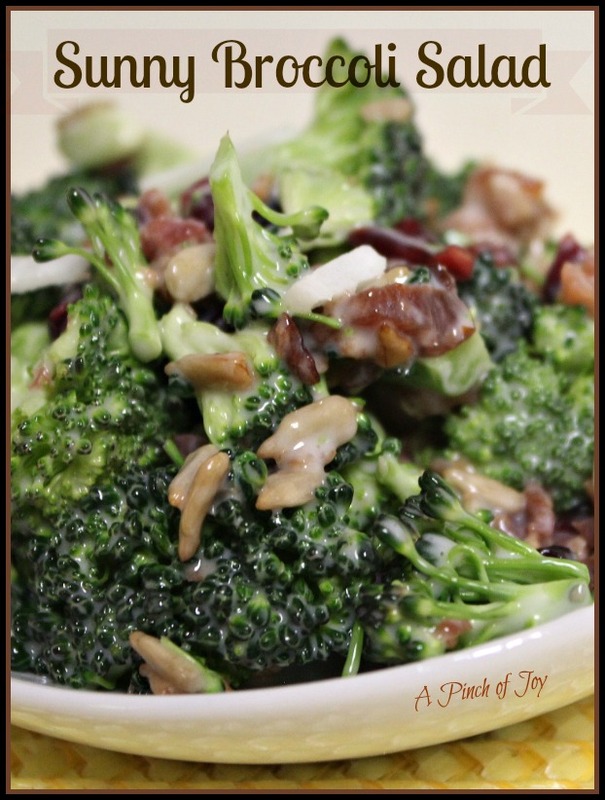 This great recipe for Broccoli Bacon Salad comes from a wonderful cook in Missouri. I led a group of volunteers, 10 adults and 21 teens, to Ste. Genevieve, Missouri where we did repair following a flood. The days were long, hot and sweaty, and everyone worked hard. Millie had a fantastic meal waiting for us each night when we returned to the church basement where we were staying. When I saw her mixing up this salad one afternoon, I thought “uh-oh, those kids will never eat this.” They did and came back for more. It is that good! Millie gave me the Broccoli Salad recipe and a piece of advice. Approaching her eighth decade of life, her days were amazingly productive. She told me: slow and steady – don’t ever rush. You never get things done right and you just wear yourself out. Just know what you need to get done during the day and keep moving that direction. That motto is as valuable as the broccoli salad! Confession: Real bacon, freshly crisped, is definitely best. However, I may think I have a week’s worth of menus and ingredients ready to go, then a work schedule changes and it is two weeks before I get back on track with the cooking. Fuzzy bacon that didn’t get used in time – not good. So I keep pre packaged bacon on hand for times when life is a scramble, ready to measure out as needed. Never any blue fuzz. Be sure to buy the the real bacon crumbles though – not a substitute. Another money saving tip: julienne the thinner parts of the broccoli stem to add to the salad. The thick parts are tough and coarse, but the smaller parts are tender and tasty. You can also add ¼ cup shredded carrot (for Thanksgiving) or diced red pepper (for Christmas) to create a colorful salad for a special occasion. Resist the impulse to add more dried fruit than is specified, if you are carb counting. One cup of broccoli has 6 carbs. One tablespoon of craisins or golden raisins has almost seven carbs. Dried fruit is concentrated sugar. Think of the size of a fresh grape, cranberry or apricot. The drying process removes moisture so the size is smaller, but the amount of sugar stays pretty much the same. Dressed with a perfectly balanced sweet sour dressing, this broccoli salad is a wonderful blend of flavor and texture. Sunflower seeds, dried fruit and a bit of onion add to the symphony. 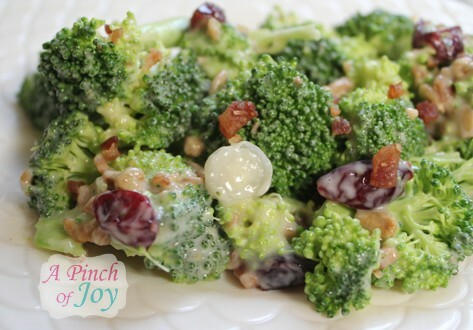 In a bowl, combine the broccoli, bacon, onion, raisins and sunflower kernels. In a small bowl, combine the dressing ingredients; stir until smooth. Pour over broccoli mixture and toss gently. Cover and refrigerate for at least 2 hours before serving, stirring occasionally. 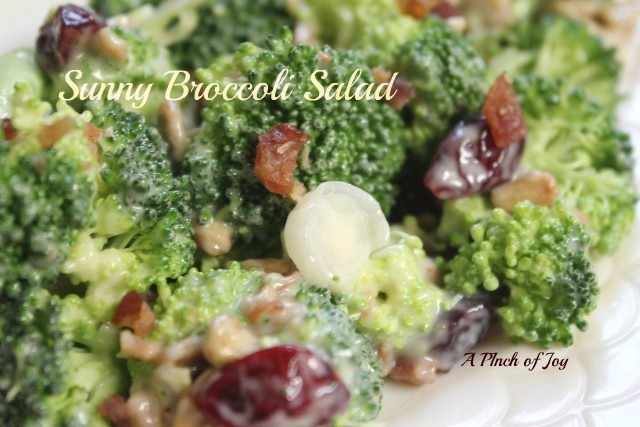 Your Broccoli salad sounds delicious – I love the addition of the bacon and the raisins! This would be perfect for holiday entertaining. Thank you for sharing your recipe with the Hearth and Soul hop. ok, I have to give you a virtual hug. I have been meaning to look up this recipe for a LONG time…and now, I don’t have to anymore! YIPEEEEEEE. Thx for linking to Tea Party Tuesday. Charlene, this is a great salad that we will really enjoy, it looks like it is full of flavor. Hope you are having a great holiday week end. Thank you so much for sharing with Full Plate Thursday and hope you will come back soon! This sounds delicious. My kids love broccoli (weird i know) I’ll have to try this recipe. This sounds really delish, and sounds so good. We eat a lot of broccoli and will be making sounds like a great change up. Wishing you a happy Thanksgiving, and thanks so much for sharing at Sunday’s Best! This salad looks amazing. Can’t wait to give it a try! I used to read The Tortoise and the Hare to the kindergarten kids. Slow and steady wins the race was the lesson. I just love Millie’s wisdom for this later stage of life….it is so true. The salad looks delicious too. Thanks, Charlene. Thanks for stopping by. I love your tying this in to one of my favorite stories — had not even thought of the connection! Perfect!